Kyung-Sook ,family we re farmers ,she worked in an electronic plant study at night whilst finally reaching the Seoul institute of arts ,her first novel came out in 1985 ,she is part of the 386 generation of Korean writers .Please look after mother is her sixth novel and the first to be translated to english a runaway best seller in her homeland . So I wondered what would make million korean’s buy this novel when I got it the blurb is appealing but not grabbing .But then I started the book and I slowly got drawn into the family .The family is a husband and wife ,the mother of the title she has disappeared en route to visit her family in Seoul ,the other characters in the family are thew soon and daughter .The story is told by each of these ,ending with the mother’s story .As the pages drifted by we learnt more and more how the mother had sacrificed so her kids could get at start in life ,but as the kids grew and moved away they maybe felt embarrassed by their simple plain mum who wore simple clothes and worked on the land .The husband tells of his wife the jobs she did round the farm her dealing with fish and making things .so we see them starting the search and as these memories drift through eaches stories you see the mother grow and the love they have for her grow as they remember here ,I ll leave the mother story as you have to read this book . A women takes on of his flyers and pauses for a moment to look at the picture of Mother .Under the clock tower where Mother used to wait for him . After he found his place in the city,Mother would arrive at Seoul station looking like a war refugee .She would walk onto the platform with bundles balanced on her head and slung over her shoulders and in her hands,the things she couldn’t otherwise carry strapped to her waist .It was amazing that she could still walk . The son’s story ,as he remembers his mum arriving when he moved away from home . The quote gets to the core of this book and why it is such a success in Korea ,but also such a great book for anyone wanting to know about Korea .As I said she is a member of the 386 generation ,this is the generation that got the country moving the ones that drew Korea from a broken country to the trading powerhouse it is today .so this story of the family is a story most Koreans have experienced as they moved from the land got good education and moved to the cities to make invent and design the numerous products we get from Korea .we see the older generations giving up so much to make this happen but also they like the family life they have and are happy ,the kids that want to get away for the country and into the modern world and large cities of Korea ,but still work hard and keep family contacts even thou the older generation to them now seem very out of step with the world .so if you want a heart-warming story of family and what parents mean this is the book to read .I must admit I now can see why a million Koreans brought it . Do you have a favourite Korean book ? Sounds like an interesting book, giving insight into a world that at first glance appears alien to us in the west, yet at the heart It’s about parents scrimping & saving to improve the lot of their offspring. another writer I was unaware of, thanks. Thanks for your kind message. Hearing such words from my online friends has been very comforting. This sounds like a lovely novel, Stu. To be honest, I have only ever read one novel by a Korean writer — ‘Comfort Woman’ by Nora Okja Keller — which was rather distressing. I’ll keep my eye out for Please Look After Mother. I got teary-eyed just reading your review of this so I know I need to read the book. I don’t think I’ve ever read any Korean lit so it will be a first for me. This sounds really interesting. We seldom think about the sacrifice parents make so their kids, and ultimately their country, can get ahead in the world. I want to read this. If I hadn’t read your review I never would have known about the book, so thanks! Wow, how many people live in Korea? It seems like a huge number to sell in a country that doesn’t have a massive population. I assume it’s South Korean, not North Korean? I’m so glad that you enjoyed this book! I loved it so much. Great review. I’ve read a few books set in Korea, but I don’t think I’ve read anything by a Korean author. I loved my holiday in Korea and would love to read some books set in the country. This sounds like my sort of book so I’ve added it to my wishlist. Thanks for drawing it to my attention. 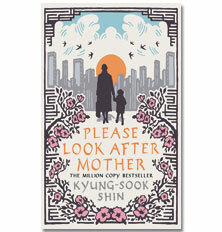 I think I would really like to read this and it would be my first Korean novel, I think. Thanks for the review. It’s interesting to think that I have never read a book written by a Korean author. I think I should, just trying to find the right time! Thanks for the intro. I love the premise. Does sound interesting. thanks, stu.